Any excess must be contained deficiencies. And deficiencies can always be handled correctly. On Android phones must never find semcam system errors that make people always irritated or difficult. Examples such as applications that suddenly closed without any problems, this can be due to a system error or the application that mengalaimi corrupt. But most are experiencing corrupt data and to address the real easy, because it must delete the data, and reset all settings as before. But there were also errors contained on the stock ROM, and to overcome it also must wait for the update of his cell phone. If the error of the stock ROM it is difficult to remove and one way to do the turn of custom ROMs and mobile phones need diroot first. In some phones Chna mostly had an error on the part settings SIM messages, and when the head of the section, will automatically direct exit or practically force close. Of course it is very annoying because it could lead to either SIM message settings to set any such delivery report, SMSC, and much more. And I have some alternative ways to overcome this, of course, does not need the ROOT. ROOT indeed have a mobile phone can be used more than usual. Could set up their own cell phone in accordance capabilities. I myself do ROOT only for its own purposes and utilize terminal and install some scripts like cURL, busybox, and others to make the phone better and faster. But there were also people who do ROOT only to cheat on games played, of course if it is only used for that alone, it is not useful. And there are many people who do ROOT to make the cell phone more bertampilan cool and have understood all the elements of a cell phone, so when the phone suffered brick, can be overcome without bringing to a handyman service. Back to the SIM messages that go out alone, it can be ascertained that there are applications on the system does not match with the one thing that is used today on the phone, there are other applications could include the ban, can be of the language, and so on. If the phone has been in ROOT, of course the biggest problem is the SMS application in the system need to be replaced. And while mobile phones are not diroot, this is just a simple problem that can be solved with up to factory reset. But before doing a factory reset, it would be better to try this way first. Please see below. Change To English - Please change the language settings and make as English. 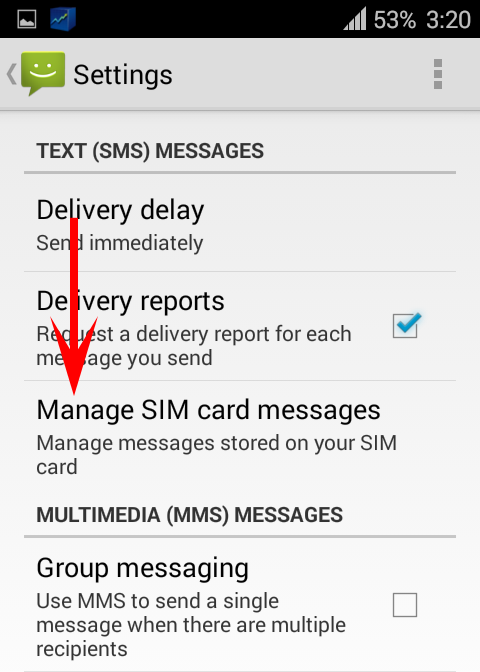 Then try to enter to the SIM message settings, if it could mean there's a problem in SMS applications that exist in the system. To overcome cell phone can wait for the update. Clear Data Messaging - Please go application settings and delete data in Messaging. then try to reopen the settings SIM messages, if you can open, which means corrupt the data on the messaging experience. Try to Download Application SMS Alternative - please try to download the application that is useful to send a message, for example, Go SMS. 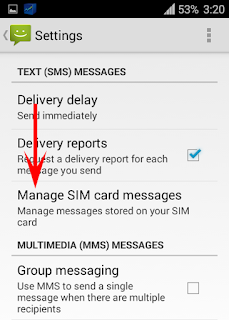 Please try towards setting SIM messages, if could mean the problem is in the SMS application on the system. Perform Factory Reset - This is a last resort if the above methods can not be used. Just do a factory reset and I guarantee that it works, because it is restoring all the settings like a new cell phone. Just a little ways can I share, and I would suggest to try from the top before performing a factory reset. Usually enough to change the language to English or Chinese are not going to find a force close. There is a big possibility, mobile phones are experiencing this kind supports IDOS, so concerned with language still less manageable. If the phone you use has the status ROOT, simply delete the messaging application on the system or could be intended uninstalling. Then take the messaging of the firmware file and reinstall. Usually this works, or it could also replace it with alternative SMS app. There are so many on the Play Store and can be selected as desired.